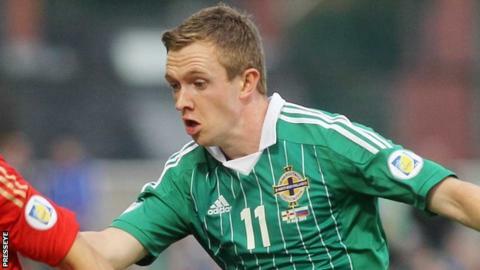 Shane Ferguson says he was happy to be handed a starting role for Northern Ireland's 2-0 Euro 2016 qualifier win over the Faroe Islands in Belfast. The Newcastle winger has not played a minute of competitive football for the under-pressure Magpies this season. After missing the victory over Hungary, Ferguson was recalled to the NI side after Chris Brunt suffered an injury. "It felt good to get 90 minutes under my belt for Northern Ireland," he said. "I want to play every international." Ferguson is ready to leave the north east Premier League giants on loan if it means keeping his Northern Ireland prospects alive. The 23-year-old accepts there is no immediate route back into manager Alan Pardew's plans and is hoping to arrange a short-term move elsewhere. He ended last season at Birmingham City, but found himself edged out as they waged a relegation battle. With Northern Ireland sitting top of qualifying Group F after two wins, Ferguson does not want to miss out any longer. "I just need to get playing now - the atmosphere around the Northern Ireland camp is great - the mood has been fantastic after the last couple of games and it makes you realise you don't want to miss any of this. "If I'm honest I'll probably have to go somewhere else. Alan Pardew has said he's been impressed with me in training but I'm still young so going out on loan could be a good thing for me." "I don't want to be sitting doing nothing, I'm not like that. I got the taste for it again on Saturday night and all I want to do now is be back playing." The majority of Ferguson's Northern Ireland career has been spent on the left wing, but he dropped into the back four against the Faroes and is willing to make it a regular thing if it means a starting spot in Michael O'Neill's side. "I had no concerns about doing the job because I've worked very hard in training and I've been doing extra sessions to make sure I was ready for Northern Ireland if I got the chance," he said. "I don't mind playing left-back, I've played there for Newcastle's first team so it's something I have in my game. "I wouldn't mind where I play, if it's left-back I'd have no hesitation at all. The main thing is to keep my place in the team."